How a pompeiian fresco appears today (left side) and how it could be appeared in roman times (right). The famous "pompeiian red" colour? It is truely a yellow modified by the high temperature of the eruption. Most of the colours that make unique the walls of Herculaneum and Pompeii was in ancient times an ochre yellow. This is the conclusion of a research made Sergio Omarini of the Istituto Nazionale di Ottica del Consiglio Nazionale delle Ricerche (INO-CNR) based in Florence, presented to Sapienza University in Rome. "Thanks to investigations we know that the colour-symbol of the archeological Campania's sites, is the result of the action of the high temperature gases emitted in advance of the final eruption in 79 AD" explaines Omarini. 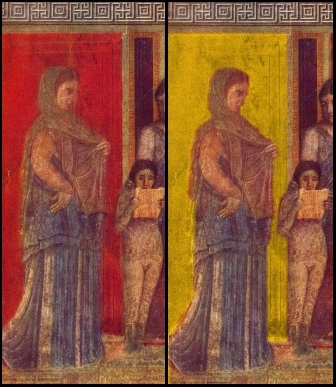 This colour mutation was already known by the experts, but this study finally allows us to define the quantity of the frescoes that were affected, at least in Herculaneum. The image of the two ancient cities, at leat the part relative to the colours, is now to be changed. Sergio Omarini of the institute said: "At the moment, there are 246 walls perceived as red, and 57 as yellow. But based on the new research, the numbers must have been, respectively, 165 and 138 for a total area of proven transformation of 150 square meters of walls. This discovery allows us to reset the original appearance of the city radically different way from how we are used to in which red, indeed 'Pompeiian red', has been prevalent." Early archaeologists who began excavating Pompeii in the 18th century were struck by the art decorating entire rooms in the richest of the Roman homes. The signature bright red used in much Roman painting was so vivid among the ruins of Pompeii that the particular shade was named after the city. "In ancient times the red colour was created using cinnabar, based on mercury sulphide (HgS), and minium, based on lead, expensive and rare pigments used mostly on the paintings, or, much cheaper, warming up the yellow ochre”, says Omarini. “This procedure is described by Pliny the Elder and Vitruvius and can be easily seen in the slits on the walls in Pompeii and Herculaneum". Investigationg were done with not-invasive instruments: a spectrum photo colorimeter for the colour and the X-Ray Fluorescence that has determined the chemical elements to exclude minium and cinnabar.